ezeep is the most intuitive and best-designed software for mobile printing and driverless printing for your campus. Nobody wants to install print drivers and use complicated apps or print management software. Printing doesn’t need to be difficult, inexplicable or limited to desktops. Eliminate complicated driver setup and the recurring hassle. Anyone can print intuitively from their devices without pages of instructions or support. Work and learning happens on mobile devices. 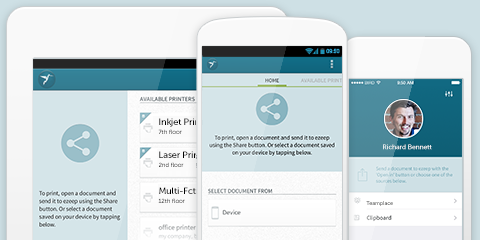 Let staff and students print from tablets and phones – securely and easily. We give you flexible and powerful print rules, limits, quotas and a payment system to control printing across your entire campus and user base. You can test a free 30-day, 10-user trial at your organization at no cost without any risk and with full support from our technical team. If ezeep isn’t right for you, just walk away. Or instantly launch the demo interface to get a feel for our product right from your browser. Simulated printers, printing and users let you experience the power behind cloud print management.